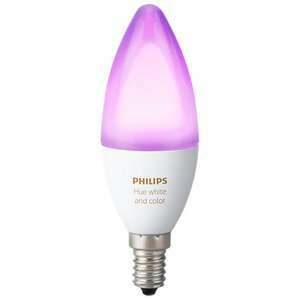 Philips Hue White and Colour E14 Bulbs , This is a multi pack buy at £99 for 3 bulbs which obviusley works out at £33 per bulb. These usually retail at approx £45 - £50 so a nice little saving if your needed some extra HUE bulbs for your lamps. Does anyone know how well these last? I normally get cheapo halogen ones for living room but they seem to die after a matter of weeks. This is misleading. The price is £99 for a triple pack, not £33 for a single bulb. Cold from me. I cant see a 3 for 2 offer at Amazon ? cold for representing the deal in a way you can't actually buy it as . This is misleading. The price is £99 for a triple pack, not £33 for a s …This is misleading. The price is £99 for a triple pack, not £33 for a single bulb. Cold from me. Misleading I guess if you struggle to read a few lines in the description. I struggled to read it due to the appalling grammar! It sounds like a pitch Del Boy would offer up down the market, oh wait! 'Roll up, roll up, get these wonderful bulbs, straight off the back of my three-wheeler, £33 a bulb, but you have to buy 3 for £99!' Bargain! LED lamps, when used properly (no overheating, no big voltage fluctuations) last many years. Plus you have a warranty. Place 3 items in your basket and the cheapest product will be free. How to claim: Add 3 items from the selection on this page to your Shopping Basket via the "Go to Basket". When you're done shopping, click the "Proceed to Checkout" button. The Offer will be automatically applied to your total customer order value at checkout if you are eligible. The discount will show at the last step of the checkout.